Schedules of which jobs should run. Log files and status of completed jobs. 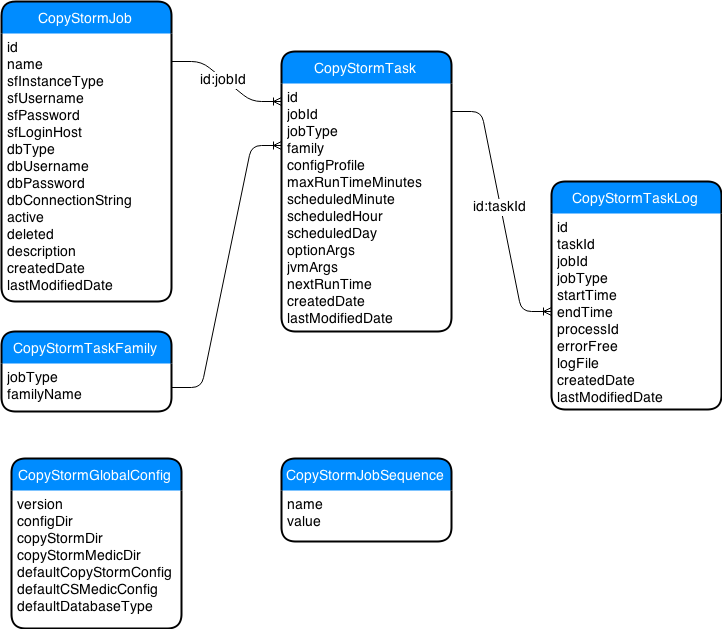 The relational database type can be any supported by Capstorm. CopyStormJob Login credentials for Salesforce instances and their corresponding backup databases. CopyStormTask A description and schedule for each CopyStorm or CopyStorm/Medic task contained within a parent CopyStormJob record. CopyStormTaskLog Status and Log file for a single run of a CopyStormTask. This table can be used to determine which tasks have run, which tasks are running, and which tasks are orphaned. CopyStormTaskFamily Registered names used to group CopyStormTask records. CopyStormGlobalConfig Information about where to find CopyStorm and CopyStorm/Medic installations. This table also contains the location of CopyStorm configuration files. CopyStormJobSequence Supports a database-independent approach for generating integer sequence values.